Landscape: The southern coast of Sri Lanka and all the way north and west to above Colombo is classic tropical shoreline: white sand beaches, coconut palms with more greenery inland, some rocky shores to give relief from the beaches. On the coast of southeastern Sri Lanka lies Yala, one of the finest National Parks for wildlife that we have visited outside of Africa. Visited: Beginning and end of our Sri Lankan visit, March, 2007. (Amanda) It was somewhat disturbing when we got to Galle to be greeted by a small runabout with four very serious-looking men in it, a machine gun on the bow and one of the men resting his arm on it. They stood off while the officials came on board, but I half expected them to circle around us menacingly. Just a friendly reminder that we were visiting a country at war. And since we tied the boat up in the military harbor, in a gated area, we were reminded of it every time we went to town. Colombo showed it even more, with the presence of police or soldiers standing on street corners with big guns and blocked-off roads. It was kind of interesting whenever I saw it, but we weren't in Colombo very long and I didn't spend much time walking around Galle. I never actually got into the old fort at all. 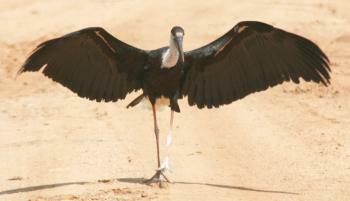 What I liked most about our time on the coast was the day we spent in Yala National Park. Driving around, just the four of us plus a guide and driver (who was as good a guide as the guide was), looking at the scenery and the animals and taking loads of pictures. I loved having the new Canon SLR camera and our good lenses, and I'd happily snap away at anything that was brightly colored or moved like it was alive. The joys of digital cameras - I could take as many pictures as I wanted and then just delete the bad ones. The animals we saw were amazing, especially the birds, but it was even awesome seeing a hare cross the road or a monitor lizard get up and run instead of pacing along patiently. Seeing elephants is always a treat, and we saw quite a few as they, either by themselves or in pairs, pulled down and devoured trees. In the afternoon light the fields of brown dirt and rock and Acacia trees looked almost like the African savannah I remember from our trip in 1998. The big Sumba Deer were new though, as were the small Chital (spotted) Deer all looking like little Bambi. We even got to watch a leopard for near on half an hour as it stalked a water buffalo and climbed a tree to groom. I write more about all this in my Sri Lanka Journal. 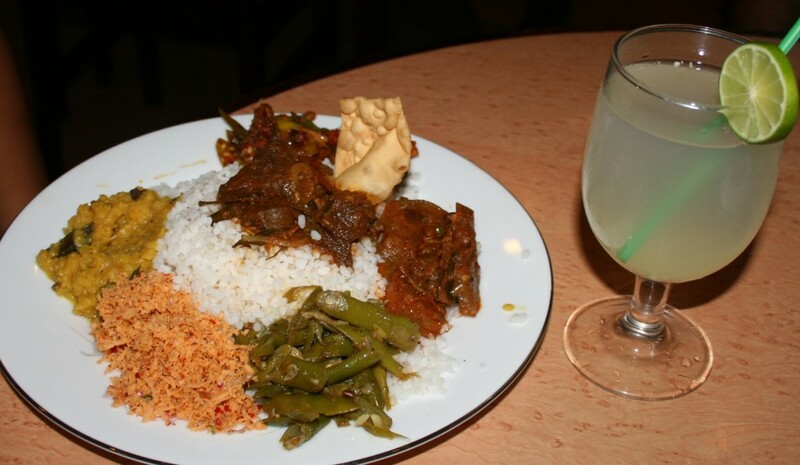 (Sue) You can smell the lush greenery and mingling curry scents of Sri Lanka from a few miles offshore. When we made landfall in Weligama for a night (we couldn't make Galle in daylight) we had been enjoying the view of the sometimes rugged, sometimes peaceful beach-lined coast for some hours. Devastated by the December 2004 tsunami, the coast is just beginning to recover -- new construction going up next to ocean-destroyed ruins. From sea, the devastation is less obvious than when you ride a train or bus north from Galle to Colombo. Here, the ruins stand stark against the peaceful blue ocean. There are foundations with only one remaining wall, or perhaps a toilet on a concrete block, or a few walls, collapsing in the center. When we spoke to a Sri Lankan friend about the poverty of the people whose homes had been destroyed he told us that people had had time to go to the NGO's for aid long ago, but some chose not to use the money to rebuild, and instead now live just inshore in new homes, keeping the ruins in place as a magnet for unsuspecting tourists who take pity on them. Whatever the reason for the ruins still being so visible, it was a shock to see the magnitude of the tsunami's destruction two years after the fact. In contrast, we saw very little of the tsunami effects in coastal Thailand which has recovered much more rapidly due to the huge influxes of money to rebuild. 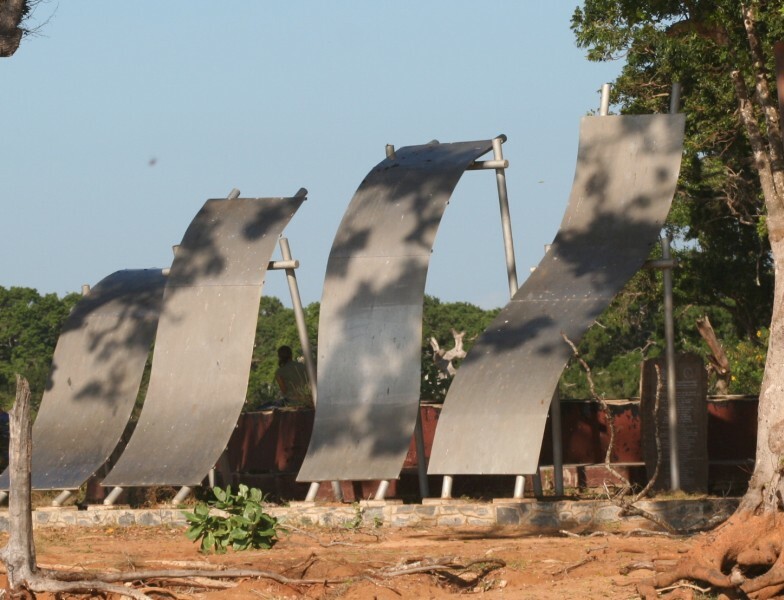 In Yala National Park, on the SE coast, we were sad to see the ruins of a park restaurant and monument to those who died in the tsunami. We were there mid-morning on a day when the sea was calm and the sky bright blue. It was very sobering to imagine that it was just such a day when death came rolling in from the sea in a series of huge waves that took away the cars, park buildings, village homes and the lives of the people who were there that fateful day. The abundant animal life teaming in the forest and savannahs stood in poignant relief to the reminders of the tsunami. Life and death in juxtaposition. In celebration of life, we were thrilled to have a wonderful day of wildlife adventures. The birding was superb and our guide knew the English common names of most of the species we saw. Green bee-eaters perched on branches right by the road, sometimes in pairs, preening, turning with their eyes alert to danger. 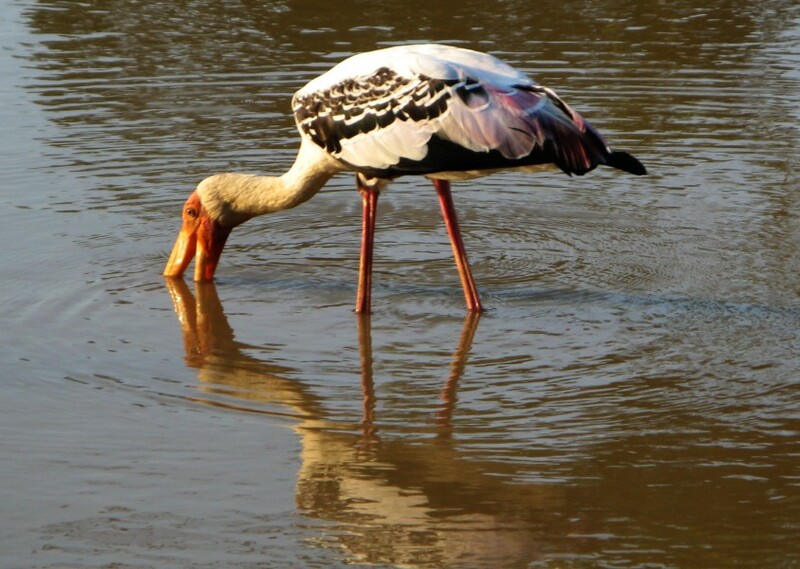 Reflected on the still ponds and dams were the colors and graceful shapes of Grey Herons and Purple Herons. Large, sometimes awkward, but always wonderful to see were the several species of storks, including the rare Black-necked Stork. (Jon) When Sue and I flew to Sri Lanka in late June of 1980, we were about the only tourists in Galle, as most had left to go to Trincomalee on the east coast. We stayed in an upscale hotel right out of Rudyard Kipling, with high-backed rattan furniture and ceiling fans stirring the sluggish air as white-suited guests with well trimmed mustaches drank gin and tonics. All the taxis were old Morris Minors (a car near and dear to my heart) and we had a trail of locals (called "touts" here) trying to sell us stuff every time we left the hotel. Today Galle seems much more bustling with a vibrant economy of its own and not as dependent on tourism. Still, they're not a people to pass up a quick buck, so lots of people offered to do stuff for us or sell us stuff. Luckily, there were lots of other tourists for them so we weren't the "Pied Piper" focus we were before. The Morris Minor taxis have all been replaced by Indian 3 wheeled "Tuk-Tuks" which race around everywhere, themselves a hazard to navigation. 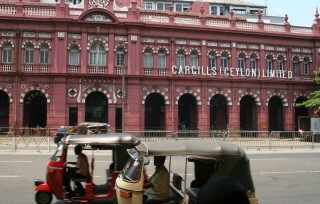 But you can still find the old "Ceylon" if you go looking for it, especially in the old fort. The fort dominates the point south of town, on the western side of the bay. I walked around the fort walls to savor the stunning views, and found that the V shaped firing slots through the thick walls were favorite canoodling spots for local couples. 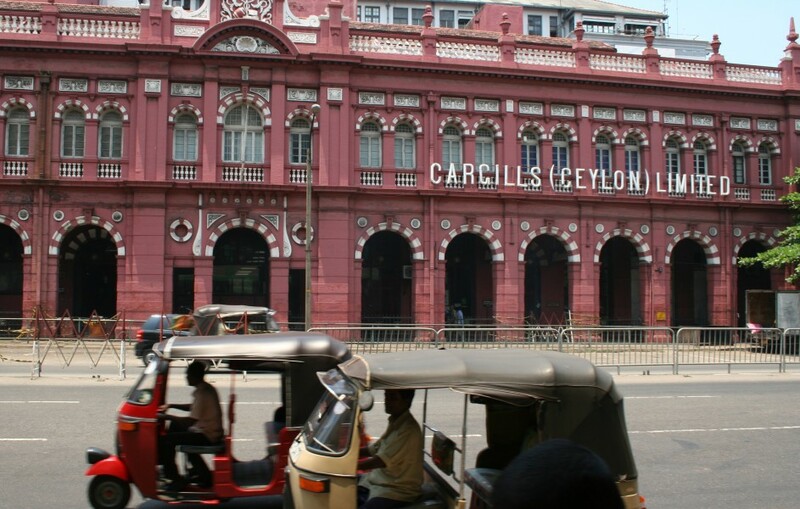 The capital of Colombo, on the other hand, is a sprawling concrete jungle. The kaleidoscope of colors and smells and people and motion is amazing. Traffic is unbelievable, so trains are the preferred means of escaping back to Galle, even though they rarely go above 30 mph (50 kph) and also seem to date back to Kipling's time - the tracks and cars are so old that the 70 mile (115 km) trip takes a good 3 hours. Elsewhere, we preferred the small "intercity" express busses that were sort-of air conditioned and didn't have a chip on their shoulder about being the fastest vehicle on the road, the way the local busses did. Interestingly, we didn't see any of the big luxury busses that were all over Thailand and Malaysia. served with fresh lemon juice. Yum. Still, the trains are good fun and the scenery is lush and verdant. I was amused to note that the "toddy tappers" are still around after 27 years. 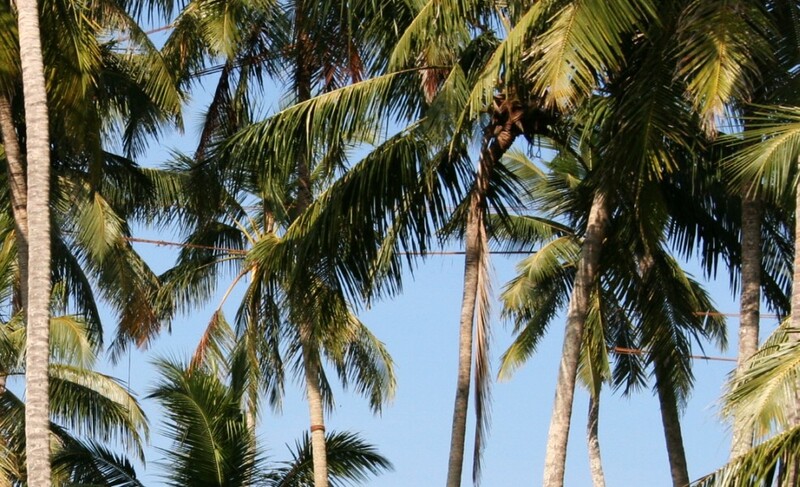 These folks climb the 80' (25m) high coconut palms and slice the immature coconut nodules to make them weep sap into a bowl suspended below the cluster of nodules. The collected sap is fermented into a beer (toddy) and further distilled into a coconut liquor called arrack. To save themselves from climbing too many trees, toddy tappers string ropes on which they walk between the tops of the trees. Food in Sri Lanka, like all of SE Asia, is a treat, especially if you like hot curries and inexpensive fine restaurants. I don't think we ever paid more than $5 for a meal (often much less) and we went to some nice restaurants. I found the curries to be much hotter than in SE Asia, where they're often mellowed with coconut cream. Restaurants, cognizant that our western palates were not acclimated to their hot curries, usually toned them down for us, but now and then one would send me gasping for a cold beer to put out the fire. Other foods like Watalappan and jaggery (palm sugar) were also delightful discoveries. The spice shops were amazing for all the flavors, colors and smells, and those shall forever be etched in my memory of Sri Lanka.